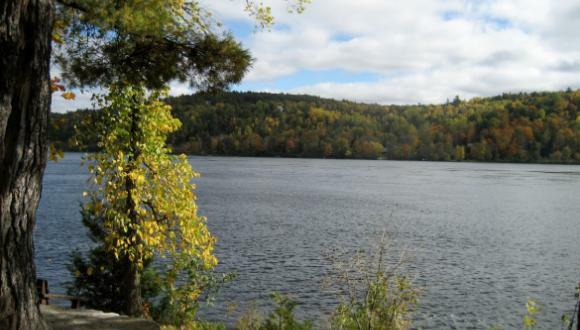 Wakefield is a small village nestled in the Gatineau hills along the shores of a scenic bay on the Gatineau River. Its main street faces on the river and has not changed much since it was founded mainly by Scottish and Irish pioneers in the early and mid-1800s. 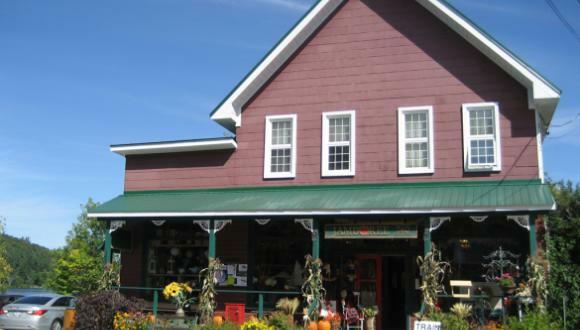 This has made the village a popular destination for tourists and visitors with an interest in its heritage, as well as its scenery and its unique opportunities for art expression and outdoor adventure, often arriving from the cities of Ottawa and Gatineau, a half-hour’s drive away. Today, my friends and I are coming here to go on a walking tour of this historic village. 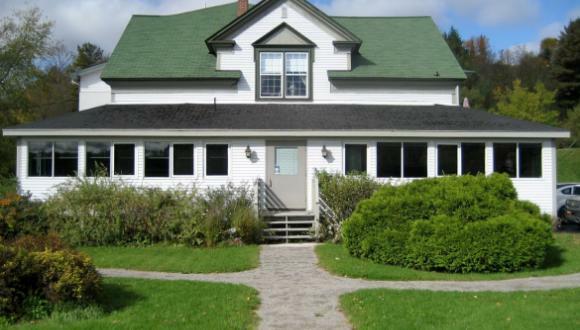 It is a glorious, sunny fall day ablaze with autumn colours as we drive through the hills and on to the Fairbairn House Heritage Centre on the east side of the river, on the northern fringe of the village. We park our cars in Hendrick Park and admire the Victorian style of the old house sitting just inside the entrance gate. Intrigued by a path behind the Fairbairn House we discover it leads through a hand-made wooden gate to giant stone steps that follow along a natural stream with small waterfalls. We are tempted to climb to the top, but today we are here to explore the village. We learned later that those steps were built by a crew of local volunteers led by Ken Bouchard, a retired gentleman who has cleared many miles of walking trails in the hills around Wakefield. We return to our cars and get water bottles and light jackets and, of course, our cameras, and take another path from the park. 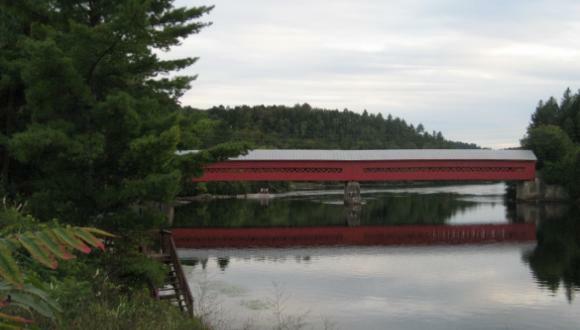 It leads, in a minute or two, to the thrilling sight of the red covered bridge up-close. We linger here to enjoy the flower gardens and plaques telling of the unique way this covered bridge was built in the years leading up to its opening in 1997. We also take time to get good pictures of the bridge and of delightful river scenes viewed from the bridge. And, we study the intricate wooden structure from inside and marvel that it was local volunteers who organized the building of this cathedral-like replacement for the first bridge that was so vital to early settlers in the development of this part of the valley. 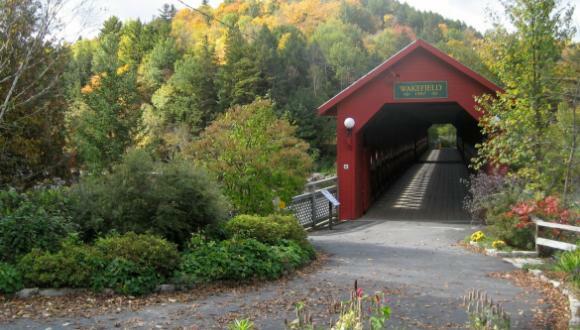 We exit onto Gendron road, the name of the first covered bridge. According to local historian Ray Daly, this road was not immediately available to connect the bridge to the village, and was built in a hurry after the bridge was completed in 1915, running through the farm of pioneer William Fairbairn who constructed the house we admired back at the park. After passing a large new condominium complex on the right, also built on Mr. Fairbairn’s original farmland, we come to Sully Road on the left, so named for the large sawmill business operated by Bernard Sully on the west side of this road in the early 1900s. In its day this mill was a mainstay in the village economy. After a five-minute walk on the still sparsely populated Sully road we come to the old CPR railway bed, constructed in the early 1890s. 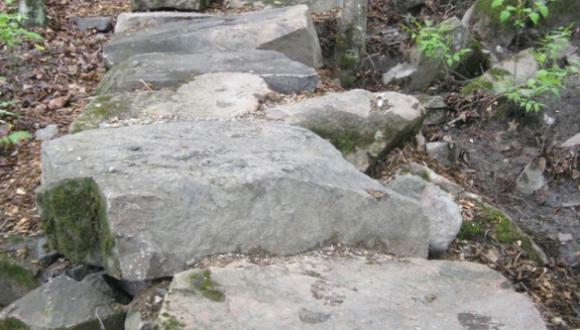 The railway bed remains here as a footpath after the rails were removed all along the line from here to Maniwaki. They were lifted a few years after both passenger service and freight service ended in the 1950s and 1980s, respectively. Here we are privileged to be joined by friend and historian Norma Geggie, the author of many books on the heritage of the Gatineau Valley. She accompanies us for the rest of our walk through the centre of the village. We turn left, heading south, and follow along the old railway footpath. Soon after, we find tracks still in place, reserved for the use of the tourist steam train that runs from its Hull station to Wakefield in fine-weather months. A few steps further along we reach the big turntable where the steam engine is rotated by hand and shunted to the opposite end of the train for the return trip to the city. This is also the site of Wakefield’s first railway station, built around 1890. 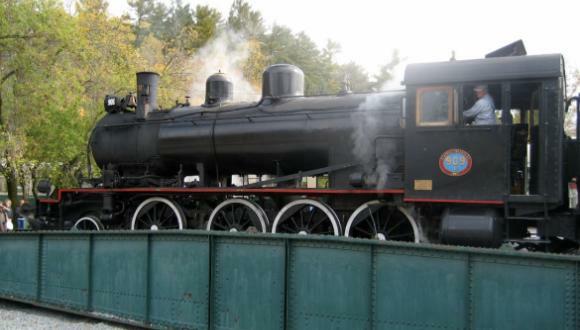 There is a small railway park here and we rest awhile before exploring the more populated part of the main street. While here, we are thrilled to see the steam train arriving, so we stay to watch the engine get balanced and turned around on the turntable. Resuming our tour past the Wakefield General store on the left we see some of the oldest houses in the village, the first being the home of early grocers, the Morrison family, and the second one an 1830s landmark owned by a series of the earliest doctors in Wakefield township; both houses are now covered by white vinyl siding. 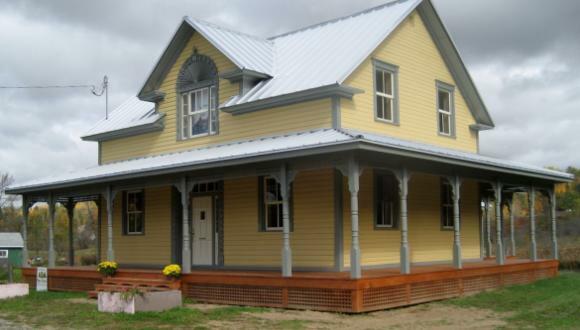 We speculate about what’s under that siding, and likely a layer of clapboards too. Directly across the street from this house is a larger, more ornate and modern doctor’s house, built in 1896, now operating as “Les Trois Erables,” a bed and breakfast. 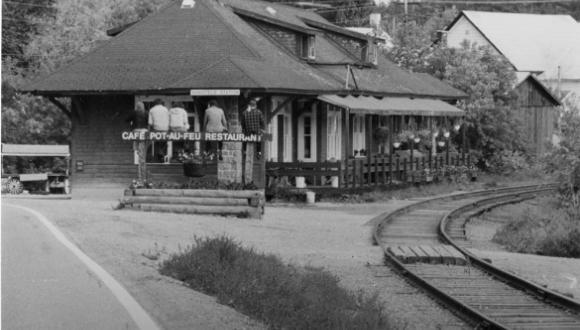 Across the street on the river's edge is a restaurant called Le Pot au feu, housed in the second railway station, built in 1929 to replace the one once located at the turntable. We walk along the river now, through scenic Geggie Park, named for the Geggie family of four doctors who in 1952 founded the Gatineau Memorial, the area’s first hospital, located across from the park. We cross the street and onto the bridge over the La Pêche River where it feeds into the Gatineau. On the bridge we have a good look at the Manor House on the right, built by the enterprising MacLaren family in the 1860s, later housing the hospital from 1952 to 1996. The old house now has a large new wing at the back and is serving as a seniors’ residence. Still on the bridge, we look further upstream towards the La Pêche waterfalls where William Fairbairn built the area’s first grist mill in 1838. Unfortunately, we can’t see the falls and the old mill from here. Norma points out that the grave of Prime Minister Lester B. Pearson, winner of the Nobel Prize for Peace, is located on the hill behind the mill and draws many visitors to the MacLaren Cemetery and memorial site there. We decide these places are on our list for another visit. As we continue our walk towards the Mill road intersection, Norma comments that this corner is a very historic spot, being the place where much of the community’s early commerce took place. The new village centre here is built on the site of the multi-purpose MacLaren department store that burned down in 1941. 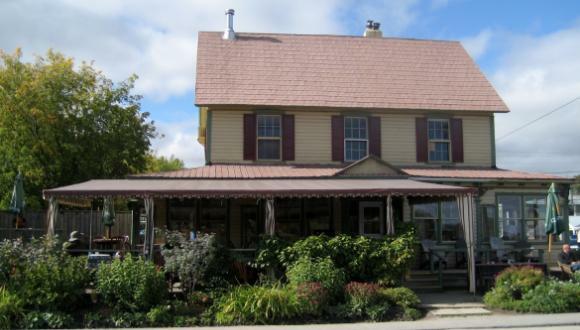 On the other corner is the Black Sheep Inn, originally the busy Temperance Hotel owned and operated by Wakefield township’s first mayor, Seth Cates, in the 1860s and 1870s. 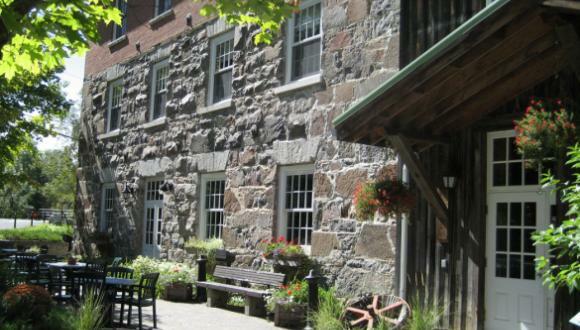 The hotel was re-built as the Chateau Diotte, later re-named Chateau Pearson. It has always been a popular venue for the latest musical acts and dances, and today the top bands still love to come here. 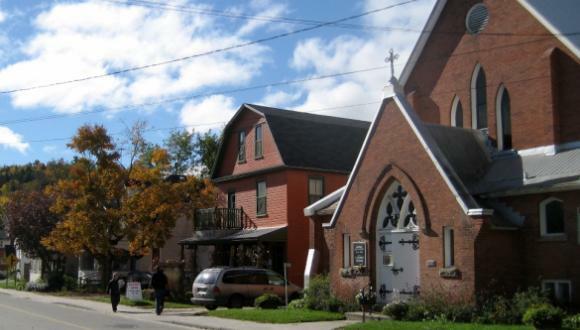 “South of the red brick church we see ahead of us, there was the Thomas hotel, the Presbyterian church, which stood on the same foundation as this United Church, and four other residences and businesses adjoining the Thomas hotel. Also, across the street, Pattersons's general store and residence, stables with horses -- all perished in the inferno. There was no fire-fighting service available then and residents tried without success to fight the fire by bucket brigade. 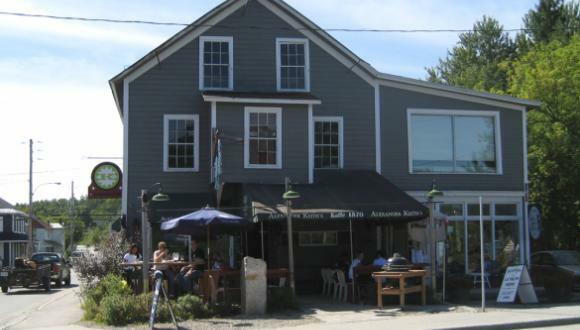 Over the years the buildings along this strip were restored, and the general store and residence re-built on the water's edge, just as we see them today. The church was rebuilt in 1905, becoming the United Church at church union in 1925. “Looking south, the destruction extended as far as the small house with gingerbread trim we see ahead. At the time, it was the leather workshop of harness-maker William Poole who lived in the house directly to the north. He gave land for the Methodist church erected next door to his home. It, too, was destroyed by fire, in the 1950s. 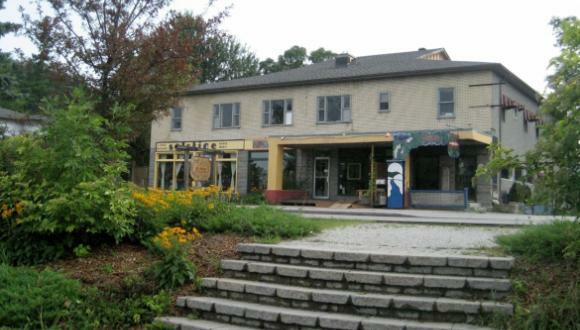 The building erected on its foundation has housed the village post office, an art gallery and other businesses, but is now a convenience store, as we will see. All of us on the tour have been completely enthralled by the trip through history that Norma Geggie has given us, and suddenly realize that it is past noon and we have reached the end of our walk for today. We decide to have lunch in the heritage house on the opposite corner in front of us. 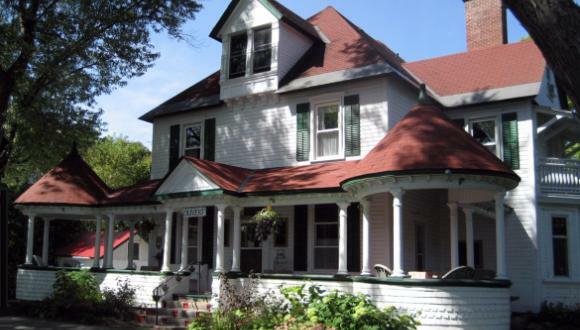 It was constructed in the 1880s as an Earle family residence, and was sold out of the family one hundred years later as a restaurant. Today’s cafe still bears the Earle name. Over lunch with Norma, we learn that Wakefield has more fascinating historic places that we have not had time to visit today. We are all eager to come back another day and see the points of interest we have missed.